This CD is a historic artifact of sorts and an intriguing one. Edmund Rubbra (1901-1986) was a prolific composer with 11 symphonies (composed between 1937 and 1979) among his 165 works. His Symphony n° 2, composed in 1937 then revised in 1950, claims one's attention from its first seconds, at least in this committed performance under Sir Adrian Boult, with its tense first movement ("Lento rubato") and muscular scherzo ("Vivace assai".) The "Adagio tranquillo" is an island of relative repose, despite its tragic undertone. The final movement ("Rondo: Allegretto amabile") brings quite a change of pace as it scampers purposefully with snatches of what sounds like a rollicking old song that gets swept along in a musical flood. The 37-minute work manages to be both intensely thoughtful and exhilarating. 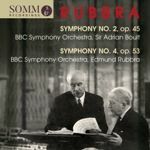 In addition to the two symphonies, the CD contains a six-minute talk which Rubbra gave on the BBC just a few days before he conducted the first performance of his Symphony n° 4.. He states that the work is a “musical essence...forming its own world”, and it is not to be descriptive of or referential to ordinary life. Its Grave introduction to the third and final movement is to “open doors in the consciousness of the listener.” However, knowing concert details (a proms concert would begin at six PM, avoiding nightly air raids with the composer/conductor in regulatory military uniform) and listening to the work's inner tension of underlying laconic cadences, one comes to the inescapable conclusion that it is a war symphony. It is not as extroverted as Dmitri Shostakovich's famous World War II Symphony n° 7, but being more stiff upper lip. It concludes with an Allegro maestoso passage with nothing triumphalist about it, but a kind of processional confidence. This recording of the Symphony n° 4 had to be assembled from nine 78 rpm sides; the notes explain how and why the result has variable quality - some of it “bright and clear”, other parts “dull and congested.” The string tone has a metallic sheen, but it really isn’t all that bad. In recent years Richard Hickox recorded all 11 symphonies, so one can obtain a more polished recording; however, Rubbra’s own performance is very much a worthy thing. Rubbra has pretty much slipped from public consciousness; apparently this began during his lifetime. Ralph Vaughan Williams seems to have come to represent the tormented era. Perhaps Rubbra’s subtleties are, well, just too subtle, which is a pity.